DESIGNED BY architopia_ we are passionate architects from munich specialized in designing corporate interiors. We develop comprehensive brand concepts and corporate interiors since 1998. EXPLORING_ the power of the subconscious parts of our brains, we created a display to provide an aesthetic solution that uses our hidden resources of perception. 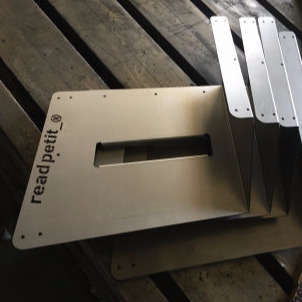 That is how readpetit_ came to life. 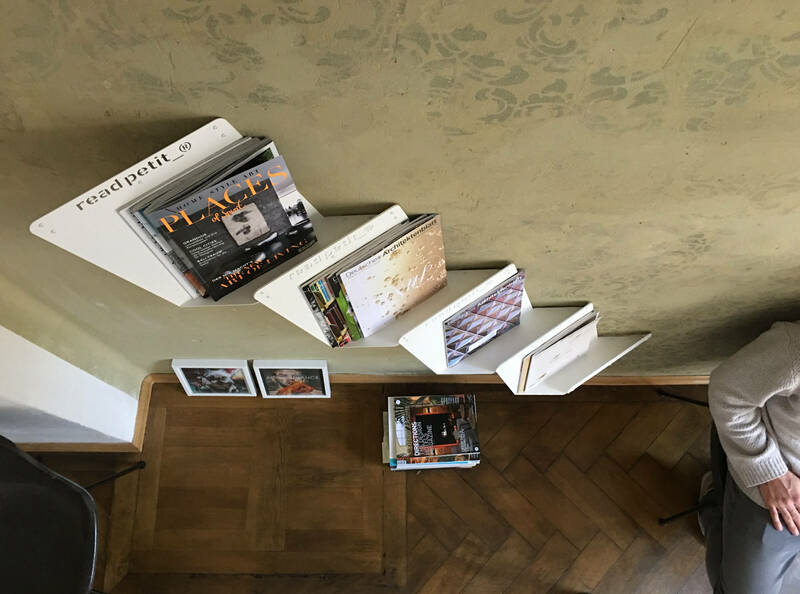 A display for the full-cover presentation of magazines and books. 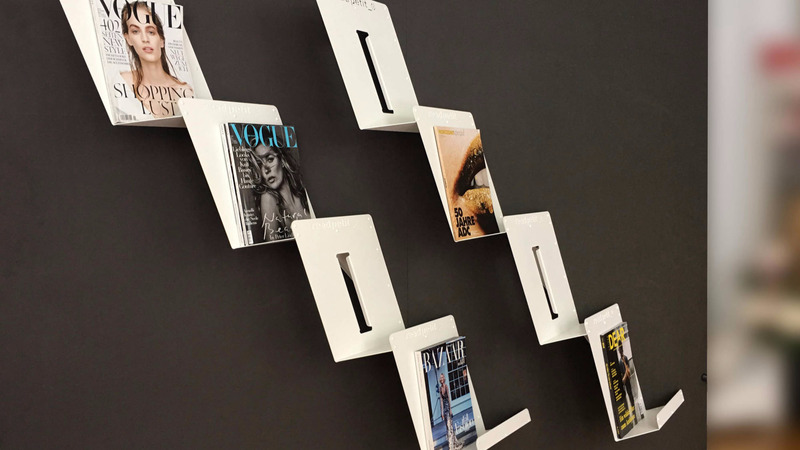 It was especially developed for corporate interiors, shops, showrooms and waiting areas. INSPIRATION_ After getting a lot of positive feedback for our little display we were wondering how many more people might like it. So here we are. We just finished the adjustments on the pre-series 02 which means, that we will be ready for production soon. SUPPORT US_ So if you like what you see, please support us. If you want us to go on, please sign in to our newsletter. We need your feedback and your ideas to take the right steps. By registering to our newsletter, you will be the first to know, as soon as we can take your preorders. 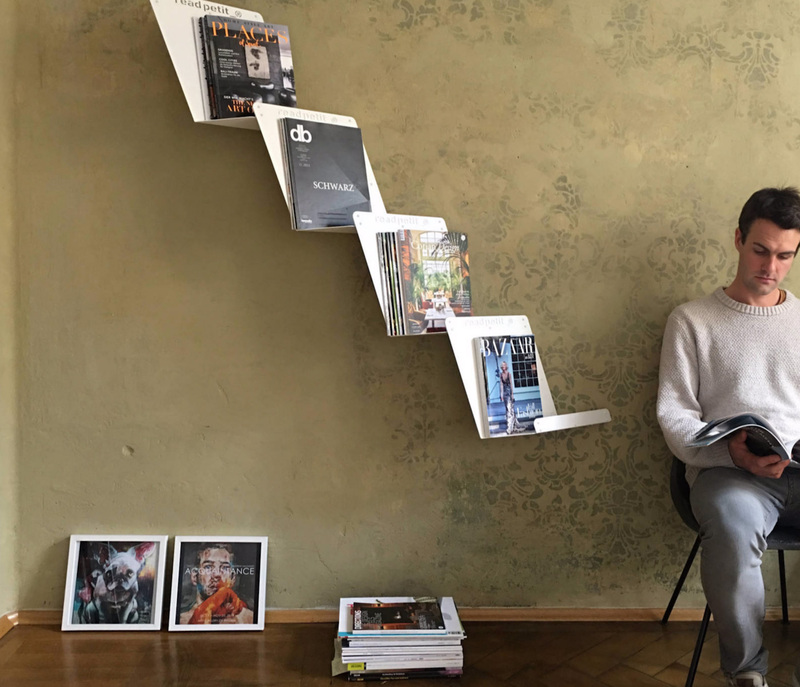 DESIGN readpetit_ showcases magazines and books in an elegant way. The unique shape stays visible behind the magazines. 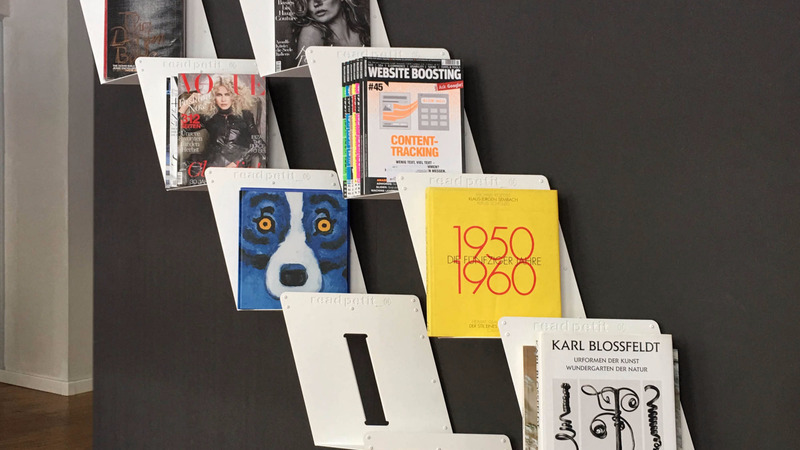 In this way, the display works like a frame, creating a more valuable visual perception of the magazines. This keeps the clarity of the design even within addition of multiple modules. CONSTRUCTION By folding the thin stainless steel panels in a unique way, a slim thus solid structure was created. 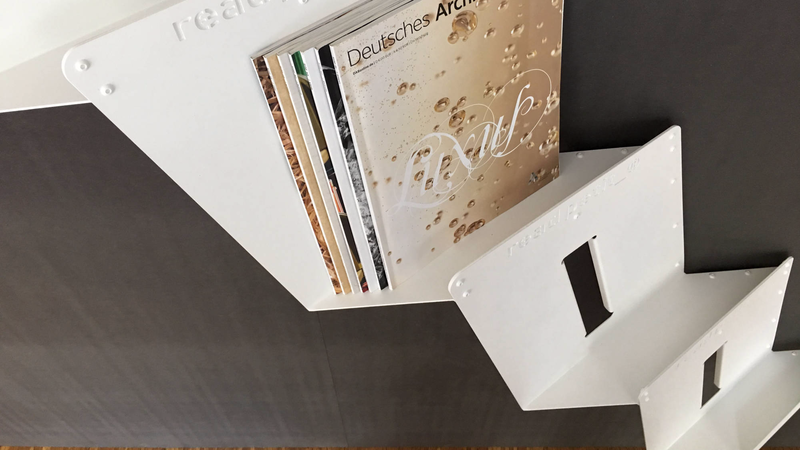 The versatile display can be assembled easily by combining any number of modules through the linking triangles on the back. These little triangles are used to strut and mount the display. 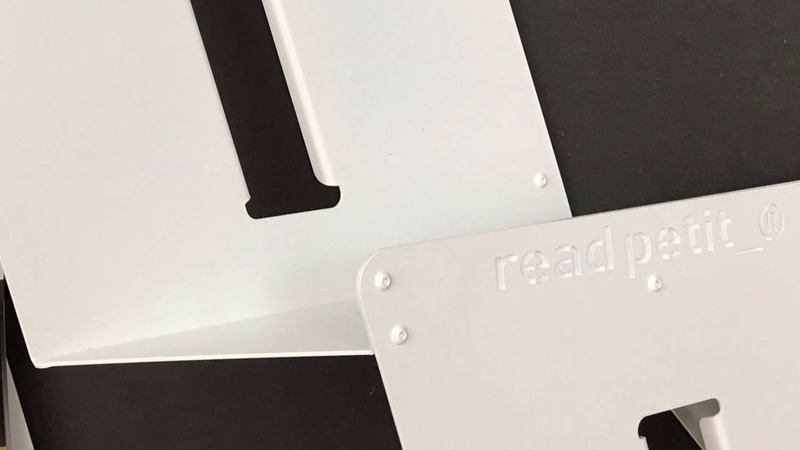 SLIM SHAPE - The slim display makes the presentation of high quality print products easy and effective even in small walkways. 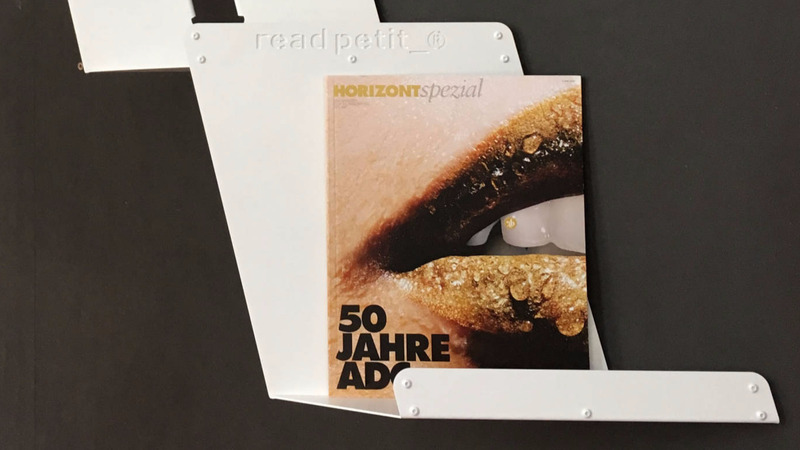 MODULAR SYSTEM - Combine any number of readpetit_ modules to create a comprehensive spacial experience for a high-class magazine presentation. CORPORATE INTERIORS - The distinct shape appeals eye-catching and can give direction in a room. CORPORATE COLOURS - Contact us to get readpetit_ in your individual CI colour. Basically every RAL colour is possible. 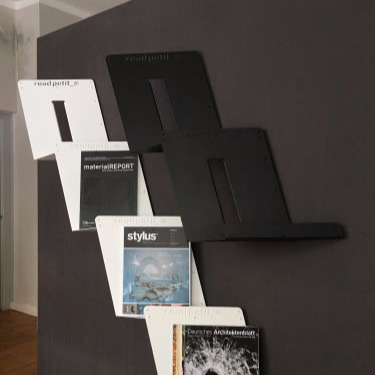 EASY INSTALLATION - One 4 piece display can be mounted to the wall by only two points. Little mounting traingles on the backside provide bracing and fixation. 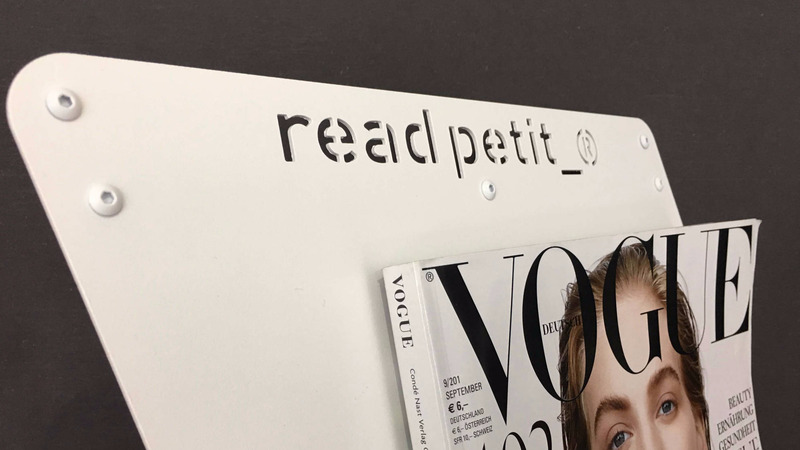 INNOVATIVE - readpetit_ is the first magazine display which turns towards the customer and therefor leaves a solid impression.